We are always so excited to receive a little package from Rimmel and were super happy to see that a matte range had been released. There are five shades in the new Velvet Matte range: Midnight Kiss*, Sumptuous Red*, Velvet Touch*, Matte-itude*, and Purple Opulence*. It's a great colour collection for winter with some very wearable shades. 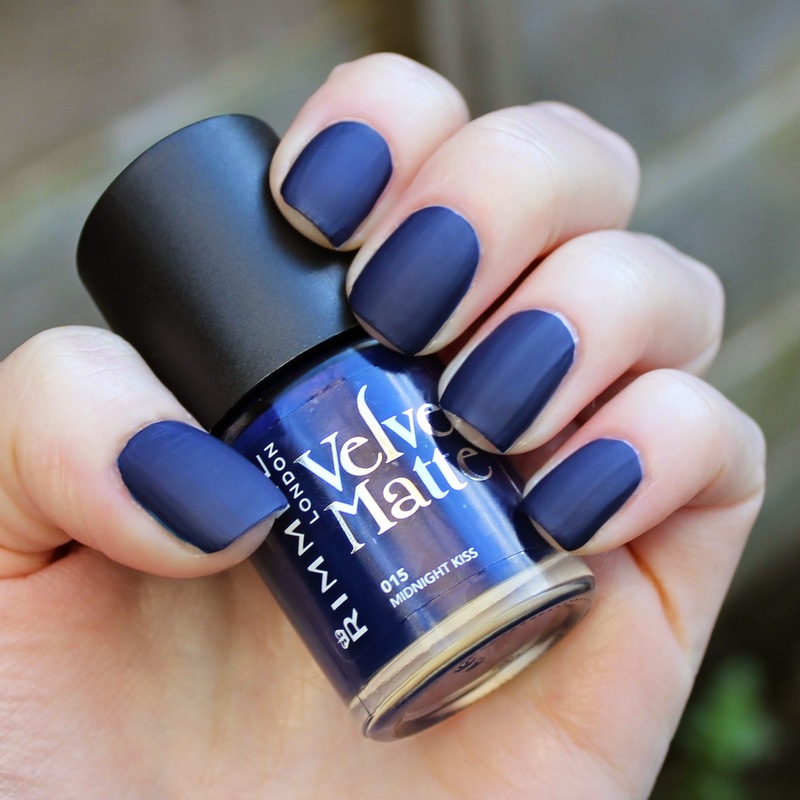 This is my favourite shade of the bunch, It is a gorgeous navy blue that applies relatively well for a matte polish. The issue I have is that my nails weren't buffed before I applied this and you can really see every ridge! This is two coats which I found enough for good coverage. This shade is another really pretty one for winter but I found the application was a lot worse than with Midnight Kiss*. As you can see on my ring fingernail the ridges were really highlighted by this polish, This is my own fault as I should've prepped my nails but buffing isn't something I do on a daily basis and I wanted to show a true application. Velvet Touch* is a gorgeous matte grey. Perfect for this time of year. The application was nice with this polish. 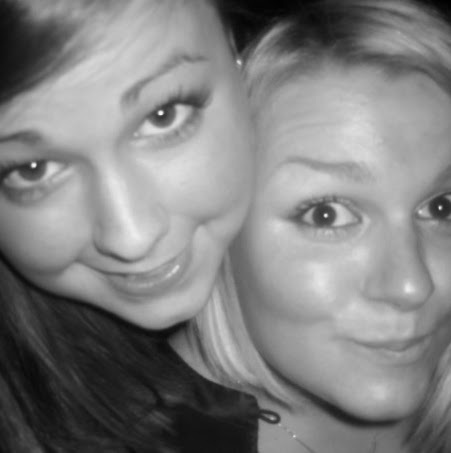 The Rimmel brush really does help - I love that brush! - but I still found it difficult to control the thin polish. I had a really hard time controlling this polish. It was so dark that any clean-up was a nightmare as you can see in the pic. There was a streakiness to the finish but I can't be sure if this was the polish or the way I applied it! Not a fan of this one at all I'm afraid. This is a really sumptuous purple that is perfect for the party season. My camera seemed to pick out the bluest tones of the polish as it is actually more of a true purple in real life. Again, I had trouble with applying this. I absolutely adore Rimmel polishes so was a tad disappointed with the application of these but I think matte polishes are difficult in general. 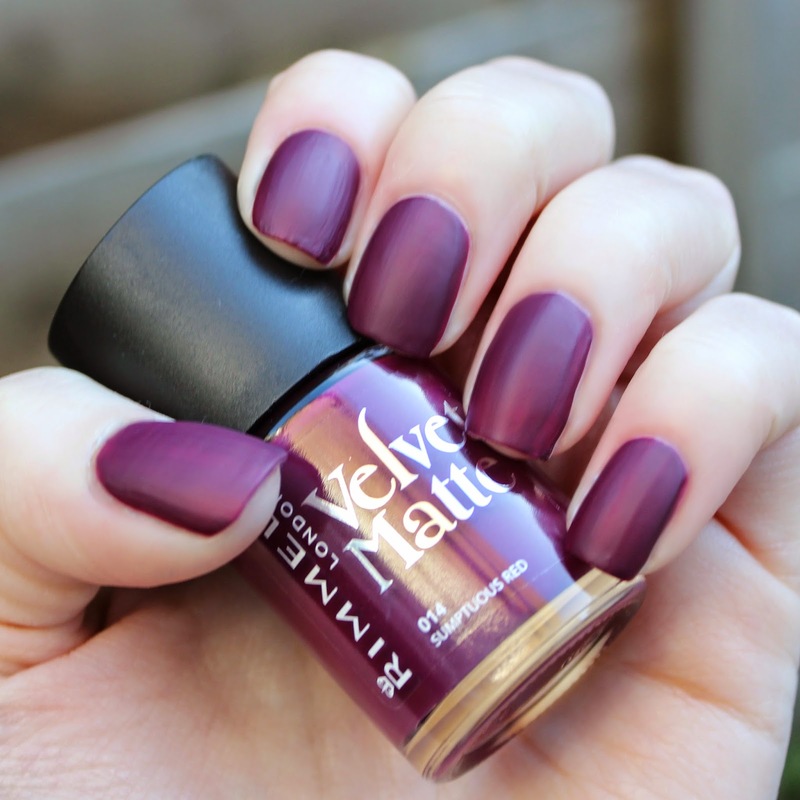 The shades are lovely for this time of year but I would advise getting shades you like and applying a separate matte top coat if you want a matte look. Jo has tipped me off on the lasting time of these polishes and it seems as though they chip quite easily so I'm afraid we aren't 100% sold on the idea. I love these colours! How do they compare to Barry M's Silk range?